The $64 Million Question – The Answer. OK Patriots, You and everyone else keep asking this. Everyone keeps reading and watching the latest political decisions and policies and just about EVERYONE shakes their head in disbelief. 24/7 on every network, in every newspaper and in most Blogs, they keep trying to explain the upside down and totally illogical decisions of our ‘leaders’ who are supposed to represent OUR thinking and OUR wishes. Well here at GLOOG the answer is an obvious one but one that most refuse to recognize, and therein lies the real problem. You can call them anything you like. Call them Republicans, Democrats, Progressives, Independents, Politicians, Judges, Congressman, Senators, Legislators, Public Servants, etc. But the one fact and common denominator remains; they are all (with few exceptions) LAWYERS! Anyway you do the math, America is now ruled 100% by LAWYERS! Scandal, disgrace, morals, patriotism, faith, religion, fairness, compassion, equality, life and death are only matters to be adjudicated and produce billable hours and then twisted to endorse their self-serving ideologies. “Politics is a game of seeking power. A certain type of person is attracted to that game. The political scene is mainly populated by the elites, those who had access to money and power that facilitated their political ascent. It also doesn’t help that the majority of US Senators are lawyers. That alone explains the eventual disconnect between politicians and their constituencies, the lack of principles and malingering moral relativism among many of our office holders. It is the nihilism and moral relativism drilled into the students at law school that ultimately provide this nation with politicians who have apparent difficulty discerning right from wrong, or even caring to make the assessment at all. This prophetic book was published in 1997 and is the Bible for all who recognize the cancer that is destroying America. Sammy Sorrell does a complete and masterful job of exposing in great detail how this cancer has managed to consume the American government and American culture. 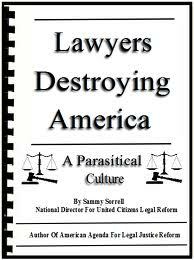 He leaves no stone unturned in answering how and why America is no longer The Land of The Free but has become The Land of Lawyers who control every aspect of our lives. Their dominance of the Judiciary did not satisfy them. 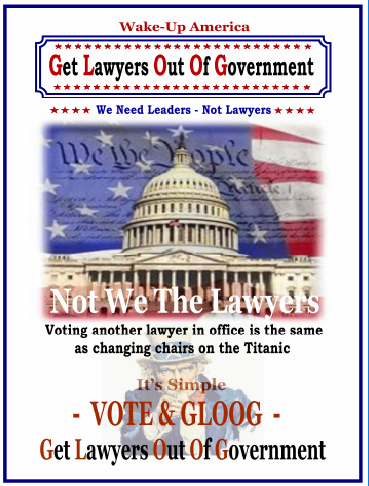 With the help of an apathetic and gullible electorate, lawyers have managed to take over the legislature and the Executive branches of local, state and the Federal government. The cancer that has spread throughout America for decades will soon become fatal unless the tumor is finally exposed and removed. This book exposes this tumor better than any before or since. GLOOG is the surgical tool to remove it.